A dedicated animal advocate and Compassionate Action for Animals volunteer died last month. Long time Compassionate Action for Animals volunteer Lauren Hanson died in September. We remember Lauren's passion and upbeat attitude. 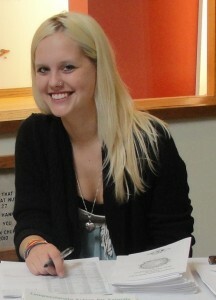 Lauren started volunteering in 2008. She planned the Thanksgiving Potluck that year, and the event was a favorite of hers. We are hosting this year's potluck in her honor. She also planned and volunteered at many other events and projects, including our Banquet, Community Office Open House, staffing our table at Taking Action for Animals, helping out at our conference, Their Lives, Our Voices and volunteering at the Twin Cities Veg Fest. She was planning the Veg Week Feed-In and screening of Vegucated when she died. She was an energetic volunteer, was consistently positive, and inspired many people to make changes to help animals in their own lives. We will miss her deeply. We will keep her spirit alive by continuing to advocate animals. I've been thinking about you a lot lately, so I decided to write you a little note. I was remembering the Valentine's potluck from a few years back and laughing about some of our conversations. Chatting with you at events was always a highlight. And I was excited to see how involved you were getting with CAA. In fact, I was hoping you'd soon be sitting next to me at board meetings. I'm sad that we can't get that beer at Triple Rock. I still haven't gone yet and it will feel weird going without you there. And I miss being able to share my new veg adventures with you. My blog is doing well. I held my first contest, I would have loved for you to see it. As my heart wells up with each line I write, I strongly believe you are with each of us who you've touched. Whenever a memory crosses my mind or if I ever feel a longing for conversation, I know that in some way you are still here, with me, with us all. I love you very much and wish you eternal peace. I met Lauren just less than three months ago. She was flying into Baltimore to attend the Taking Action For Animals conference in the DC-region. Per the request of CAA's Unny, I agreed to let Lauren stay at my place while she was in town. During the brief time that I spent with her, it didn't take long to realize that she was an especially warm and authentic person, and a lot of fun, to boot!. After the conference, I drove Lauren to the airport, and asked what she thought about the weekend. She raved about how she had met some of the best people she'd ever met — individuals who were not only fun to hang out with, but who shared her deep concern for animals, as well. So I was incredibly saddened to hear that Lauren was no longer with us, as she turning her genuine empathy for animals into concrete action for them. I'm so grateful that I got the chance to meet her this summer, and I'll continue to cherish my car rides and conversations with her. My heart goes out to Lauren, her family, and her loved ones. She is deeply missed. I had the pleasure of working with Lauren since she started volunteering and I'm glad I go the chance to know her. We had so much fun and her energy and enthusiasm were an inspiration to me. We shared a similar joy in being animal advocates, and her loss has touched me deeply.